of the Finnish, Ergonomics Society has been presented to the National development of patient transfer ergonomics in the health care sector. The Ergonomics Award is presented to the Researcher, PhD Leena Tamminen-Peter. She is also a professional physiotherapist and teacher of nursing. Ms Tamminen-Peter works at the Institute of Occupational Health in Turku. Leena Tamminen-Peter has in the past 20 years participated in the development of health care personnel’s education and competence and in the dissemination of ergonomic knowledge to the staff in patient transfer work and health care students. She emphasises the importance of patient transfer ergonomics as an activity to activate patients and assist and support them through many kinds of methods and aids. Ms Tamminen-Peter has worked as an educator in the theory and practice of patient transfer ergonomics both in educational establishments and at workplaces all over the country. She has acted in several international working groups in the health care sector and as a lecturer participated in various international congresses and work seminars. sisältöä, tietoutta ja koulutusta. Palkinnon luovuttaa Keskinäinen Eläkevakuutusyhtiö Etera. hoitoprosessia ja vaikuttaa samalla hoidon laadun kautta sen lopputulokseen. Potilassiirtoergonomian kehittämistyötä on tehty pitkäjänteisesti, monissa kehittämishankkeissa. SHO, FT Leena Tamminen-Peterille. Tamminen-Peter työskentelee Työterveyslaitoksella Turussa. käsitettä, joka aktivoi potilaita sekä avustaa ja tukee heitä monin toimintamuodoin ja apuvälinein. 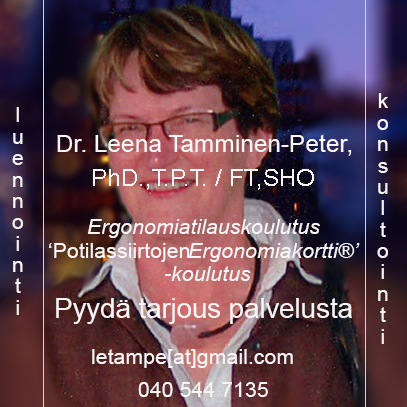 Leena Tamminen-Peter, Researcher, Finnish Institute of Occupational Health Turku.